It's the final day and it's going to be a long one, as the top eight Hotshots try to stay busy and keep their minds occupied before the grand finale. Last night's dinner and ONE Africa Concert will at least give them plenty to talk about. For their last night they were spoiled by Big Brother with a six-course meal and performances by seven African artists. 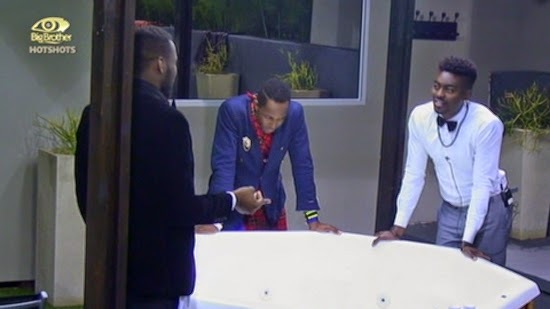 They asked the Hotshots a lot of questions about the game – giving them the perfect chance to reflect on their journey in the Big Brother Africa house. The final Extravaganza will take place tonight and housemates spent time yesterday preparing. During the afternoon they took it easy, although they often filled the house with rapping and drumming as the five remaining men hung out together in the living room. They will also get a chance to reunite with their former housemates and after receiving encouraging messages from them during the dinner party they are probably even more excited to see them. Make sure you keep on watching to see all your favourite Hotshots tonight and to see who wins the big prize!